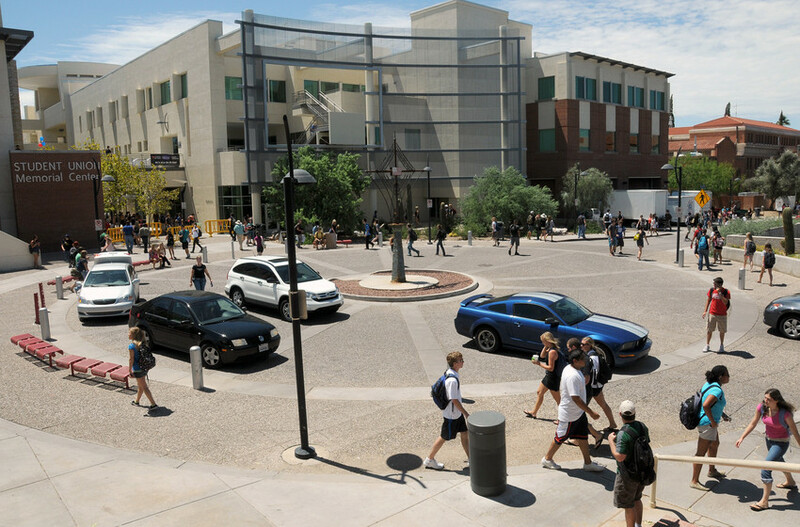 The Arizona Board of Regents will vote to approve proposals for 2018-2019 base tuition and mandatory fees, along with residence housing and meal plans, for the three state universities during this week's meeting at the University of Arizona's Student Union Memorial Center. The vote is scheduled for Thursday at 10:30 a.m. The meeting will be livestreamed. On March 16, the UA proposed a 2 percent increase in tuition and no increase in mandatory fees for all entering undergraduate students. The majority of current UA students will see no increase because their tuition and fees previously were frozen under the UA's Guaranteed Tuition Plan. For the College of Medicine – Tucson and the College of Medicine – Phoenix, the UA proposes an increase of 3 percent for both resident and nonresident students. This proposal also eliminates the program fee component and reestablishes it as a single base tuition rate. The Arizona Board of Regents held a livestreamed public hearing on March 27 to discuss the tuition recommendations made by the three state universities, as well as a tuition workshop on March 29 where the university presidents presented their proposals in person. Robert Williams, the E. Thomas Sullivan Professor of Law and faculty co-chair of the UA Indigenous Peoples Law and Policy Program. Steven Schwartz, professor of chemistry and biochemistry and of applied mathematics in the Department of Chemistry and Biochemistry. David Breshears, professor of natural resources in the School of Natural Resources and the Environment, with a joint affiliation with the Department of Ecology and Evolutionary Biology. Dr. Allan Hamilton, professor of surgery, radiation oncology, psychology, and electrical and computer engineering with the UA College of Medicine – Tucson. Barbara Mills, professor of anthropology and American Indian Studies and a curator of archeology with the School of Anthropology. The board will vote on new contract terms for UA Men's Basketball Coach Sean Miller. The board will vote to approve transition terms for ABOR President Eileen Klein, who announced on March 26 that she plans to step down from her role in June. The proposal calls for her to be named President Emerita and to be awarded the Regents Medal. The board will review proposed revisions to the student code of conduct, which will update definitions and prohibitions and require each university to maintain and publish a list of permitted personal safety devices, including personal alarms, chemical repellents and other devices. The UA will ask the board to approve a lease between Pima County as landlord and the UA as tenant for the UA Gem & Mineral Museum in the historic Pima County Courthouse in downtown Tucson.